I consider it quite a daring move on my part to come out as an evangelical, given some recent polls, published in UnChristian. These indicate that among young people who aren’t church-goers, 49% think ‘evangelical’ is a dirty word...and only 3% think good thoughts when the word is mentioned. In other words, there is an 16:1 ratio of bad connotations to good. So odds are good that you think less of me now than you did before I opened my mouth. So why would I admit the label? Simply because evangelicals are my people. The truth is, though, that I’m beginning to wonder if “my people” really want me anymore. It seems that since being educated in some of our/their most prestigious evangelical schools, I somehow no longer belong. As I was finishing up at Fuller seminary, I began a conversation with an evangelical Christian high school about filling an open position as a Bible teacher. All was going so well I thought it was a done deal, until the head of the Bible department asked me about my view of the Bible. My answer would have made my Fuller professors beam. I talked about its divine authority and its contextual nature. Then I gave an example: “I don’t believe Scripture intends to teach us that creation happened in a literal 7-days, but rather that it demonstrates, by deliberate contrast with the then dominant creation myths, the true nature of God's good intention for creation, and most importantly, his love for humankind.” Suffice it to say, ‘my people’ didn’t want me teaching their students. More recent events, which are too raw to mention, have been even more painful. And now, I find myself ready to identify as a recovering evangelical. St. Augustine, a major source of Christian theology, has this jarring quote that rings true for me, and I suspect for many of my post-evangelical peers. He said “The church is a hoar, but she is my mother.” Well, when it comes to my relationship with evangelicalism, that about sums it up. I wouldn’t brag about her virtue, but I no less owe her an eternal debt. It's so difficult when your people don't want you. I'm sorry you're experiencing that, Chris. I know it isn't the first time for you, but that doesn't make it easy. I think gratitude is as good a protection against bitterness as any. Thanks for reminding us "recovering evangelicals" of our roots. Also, we're preparing ourselves for a big move (VA to Miami) with a new baby (two and a half weeks). Isn't it amazing it pours when it rains? You're not along my friend. I could go into a lengthy discussion on why I don't fit the "evangelical" anymore...at least the confused evangelical label that seems to exist today. But this is your blog. You and I have some very different views on our faith, but we are brothers. Both of us want to share our faith, but we do it differently. Hang in there and stay true to the faith. Let wisdom add grace to your knowledge and you'll come out victorious. God bless from your Calvinistic, Reformed, Catholic loving, charismatic, amillennialist, contemplative, old world creationist, expository preaching loving, evangelical brother in Christ. Just so you know dude, *I* want you in the movement, in the church, and I'm proud to call myself your brother. And you know I'm with you 100% on Genesis and a whole lotta other stuff. Correction..first sentence...You're not ALONE my friend. Sigh...fingers always seem to work independently of the brain. Just so you know, *I* want you in the evangelical movement and in the church. 'course I'm not sure if "they" want me either, given that I'm with you completely on Genesis and everything else I've seen and heard from you. Thanks, Collin, Steve and Rich! Recently left evangelicalism after long years in non-denominational churches. I feel evangelicalism left me rather than the other way round. After a period of spiritually abusive leadership we ended up in a growing, vibrant, evangelical church. It began to get so much into marketing, branding and megamania that the Bible became an afterthought. Now, in a United Methodist church, of all places, we are back in scripture and also enjoying all the delights of older folks, hymns rich in meaning and a family feel. Never thought we'd be here in this "liberal" denomination, but here we are. I'd love to have you teaching *my* students! In fact, I just read your thought about creation to my almost 5-year old, which led a cool discussion (along with lots of definition!). Amy - So glad to hear just that sentence sparked some good conversation. Far from feeling that Bible teachers should avoid the challenges in Genesis, I think it's one of the best case studies to use in teaching people (of all ages) what the bible is (and is not) and how to read it as God intended. Provender - I wouldn't call my experiences 'abuse' but I'm glad for your ministry. While you say you 'left evangelicalism" I'm pretty sure you just mean you found a different church...one that actually sounds more evangelical that your non-denom homes that bore the label. I don't know if literal Fundamentalist is necessarily the same as Evangelical. May you see and proclaim the good news of Christ in our midst. practicinghuman - Indeed. 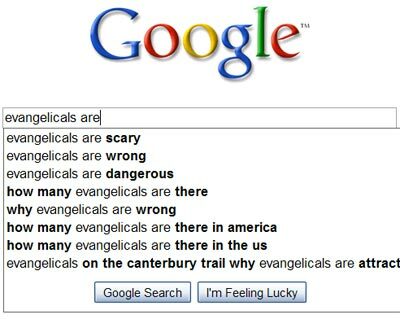 Not all evangelicals are literal Fundamentalists, but so many are (and think that's the only option that defends biblical authority) that it's hard to find room for myself among them. And with the term having such negative connotations outside the church, it's hard for me to think of any reason to fight to be included. The same could be said about those who have mingled their religious devotion with nationalistic zeal or Republican politics.